The Credit Suisse Global Wealth Report 2016 has revealed that 1% of Indians now own 58.4% of the country’s wealth. 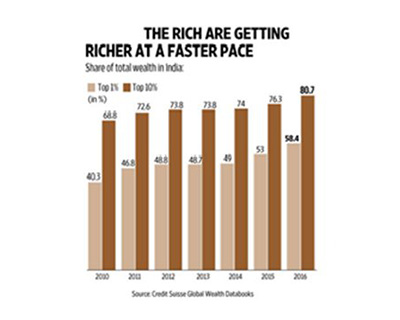 The report shows that the share of wealth of the top 1% has been steadily increasing since 2010. India’s economic disparity is only increasing with increased economic growth. With this colossal failure of the “trickle-down” theory of economic progress, India must act urgently to address the scourge of inequality. According to the latest data on global wealth from Credit Suisse Group AG, the financial services company based in Zurich, the total quantum of wealth is rising in India but so is the disparity between those who have wealth and those deprived of it. The study said that wealth in India in local currency terms increased 5.1 per cent in 2016 but due to adverse currency exchange movements, India’s household wealth fell by 0.8 per cent to $3 trillion in dollar terms.The richest 1% of Indians now own 58.4% of the country’s wealth. Credit Suisse has published the report every year since 2010. The share of the top 1% is up from 53% last year. In the last two years, the share of the top 1% has increased at a cracking pace, from 49% in 2014 to 58.4% in 2016. The numbers suggest that the very rich are expanding their share at a faster rate during the current government. The richest 10% of Indians have increased their share of the pie from 68.8% in 2010 to 80.7% by 2016. In sharp contrast, the bottom half of the Indian people own a mere 2.1% of the country’s wealth. 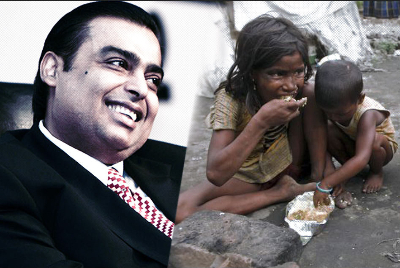 Data shows that India’s richest do well for themselves irrespective of which government is in power. In 2000, for instance, the share of the richest 1% was a comparatively low 36.8% of the country’s wealth. The data clearly indicates that most of the gains from the country’s high rate of economic growth have gone to the rich. India has committed to attaining the Sustainable Development Goals by 2030, and to ending extreme poverty by that year. 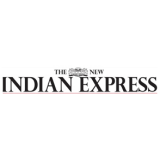 But unless the country reduces the rising levels of extreme inequality, the dream of ending extreme poverty for the 30 crore Indians – a quarter of the population – who live below an extremely low poverty line, will remain a pipe dream. For the third year running, the World Economic Forum’s Global Risks Report 2016 has found “severe income disparity” to be one of the top global risks in the coming decade. This indicates that it is not just about morality – inequality plainly hurts economic growth (or will someday); a better balance actually sets the foundation for sustainable growth. Equitable distribution would be beneficial for many reasons. The aspirational poor tend to take on too much leverage in order to achieve a lifestyle of a certain order, thus creating boom-bust cycles at the micro and macro levels. The less rich spend a much larger portion of their wealth. The uber-rich can buy only so many homes or cars.Hence, growth will accelerate only when wealth is more evenly distributed. Costs of inequality are borne by the rich, eventually. 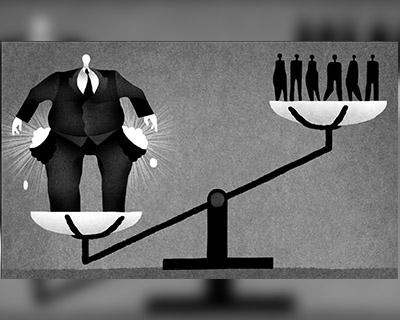 First order cost effects of inequality are in the form of schemes such as Mahatma Gandhi National Employment Guarantee Act, Food Security Bill, fuel subsidies, etc., borne by the entire tax-payer base. Second order effects come from a stunted future for the world where malnourished and under-educated sections of the population deflate notions of a demographic dividend, turning it into a demographic disaster. Third order effects are social disorder, rise in terrorism, Naxalism, street crime, disease, etc. The rich cannot wish these problems away nor can they insure themselves against these, beyond a point. Even as trends suggest a staggering disparity in wealth distribution, in a globalized world, the interests of the rich and poor will increasingly converge. An investment in equality would thus be an investment in one’s own future. When do we find the other indicators pointing to inequality in India? Gini coefficient is the most popular measure of inequality and takes into account income distribution among residents of a country. The income in this case has been calculated net of taxes and transfers.The higher the Gini coefficient, the greater is the inequality. There is a "huge" gap in data about income tax in India. Since most of the population is out of income-tax database (only 5.5% of earning individuals pay taxes in India), most of the calculations (such as those by the National Sample Survey Organization, NSSO) are based on consumption-expenditure data instead of income data. In 2016, the International Monetary Fund in its regional economic outlook for Asia and Pacific said that India’s Gini coefficient rose to 0.51 in 2013 from 0.45 in 1990, mainly on account of rising inequality between urban and rural areas as well as within urban areas. This meant that after more than two decades of liberalization, privatization and globalization (LPG) reforms, India has become a more unequal place. 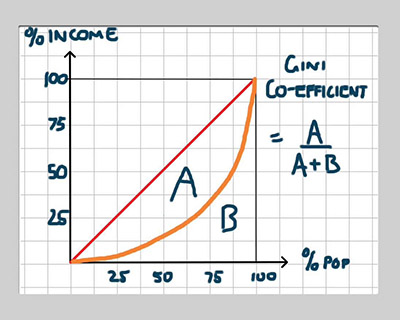 Note: Gini coefficient is derived from the Lorenz curve framework. The Lorenz curve shows the percentage of total income earned by cumulative percentage of the population. In a perfectly equal society, the “poorest” 25% of the population would earn 25% of the total income, the “poorest” 50% of the population would earn 50% of the total income and the Lorenz curve would follow the path of the 45° line of equality. As inequality increases, the Lorenz curve deviates from the line of equality; the “poorest” 25% of the population may earn 10% of the total income; the “poorest” 50% of the population may earn 20% of the total income and so on. Where are the reasons for this concentration of wealth in a welfare state? Unhindered capitalism necessarily results in extreme inequality and it is up to governments to institute measures to balance it. Thomas Piketty, a French economist and author of the acclaimed book Capital in the Twenty-First Century, studied seven centuries of data across 20 countries and found that inequality has reduced only in a redistributive welfare state environment. This has intuitive appeal. In its most natural and crude form, capitalism necessarily assumes that everything can be bought and sold, even justifying slavery as a commercial pursuit. Consequently, capitalism can only co-exist with civilized society in a sterilized form; with restrictions on what can be bought and sold. Apart from protecting life, liberty and property, the primary role of government is to prescribe limits within which capitalism operates. 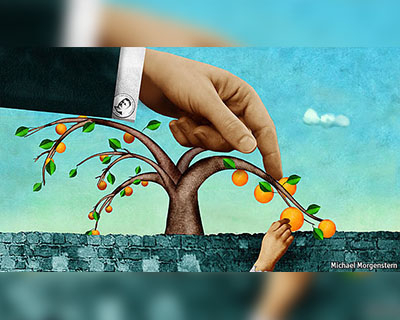 Since the economic reforms of 1991, India has moved towards market fundamentalism which insists that economic growth requires reduced government interventions, and further freeing up markets. Post-reform policies like reduction in public investments in crucial sectors like agriculture and infrastructure development, reductions in employment opportunities in most public sector industries, closing down of loss-making public sector units etc. had adverse impact on the income earning capabilities of the working population. Financial sector reforms and the export-import policies implemented in the post-reform period also resulted in growing inequalities in India. Reluctance of banks to lend to the priority sectors has resulted in reduced financial empowerment of small farmers and medium-scale industries. Labour-intensive sectors were relegated and capital-intensive, labour displacing sectors were encouraged. Declining labour share in national income and the failure of wages to keep up with productivity are also among the major causes of increased inequality. At the root of the crisis is the skewed distribution of assets including land and capital, access to education, coupled with growth imbalances and slow job creation. The moral indifference towards the poor within India’s political class has contributed to growing inequality. Who are these one percent? For 2010-11, India’s one per cent included households having an annual income of over Rs 12.5 lakh (around 18,000 USD), showed an analysis by the Centre for Macro Consumer Research (CMCR) of the National Council of Applied Economic Research (NCAER). The research houses call them the affluent or the rich. The cut-off to enter India’s one per cent — Rs 12.5 lakh — is nothing to write home about compared to global standards. The cut-off point for the top one per cent in the US varies from about $500,000 to $700,000. If one takes the lower figure ($500,000, equal to Rs 2.6 crore), it is over 20 times the Indian figure. Adjusted for purchasing power parity, it would be around 10 times. 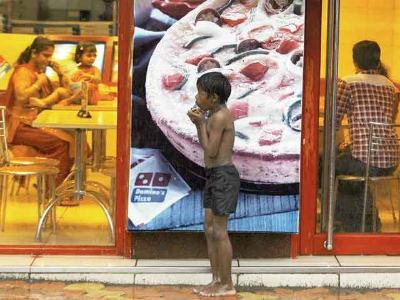 According to the NCAER-CMCR study, unlike other income groups, the rich actually end up spending only 40 per cent of their total expenditure on food, which is the least when compared to other income groups, such as the middle class - 42.5 per cent, the aspirers - 47.5 per cent and the deprived - 57.3 per cent. The rich, middle class and aspirers clearly realise the importance of education and its correlation with income. Not surprisingly, as much as 8.8 per cent of the expenditure of the affluent is on education alone, while the same is 9.2 per cent in case of the middle class. Notably, it is as high as 8.1 per cent in the case of aspirers, which only indicates the importance they accord to a sound educational background. In contrast, the spending on education is just 5.7 per cent in case of the deprived. The study says education attainment levels correspond directly with growth in income. The higher the level of education, the higher is the impact on income. For example, on households, where the chief earner has only primary-level education, the impact is 22 per cent. But, it is 264 per cent if the chief earner is a graduate and above. How can this inequality be reduced? 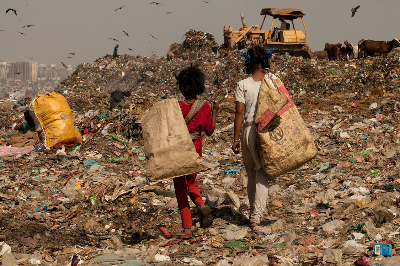 The continued rise of economic inequality in India is not inevitable. It is the result of policy choices. The government can start to reduce inequality by rejecting market fundamentalism, opposing the special interests of powerful elites, and changing the rules and systems that have led to this situation.They need to implement reforms that redistribute money and power and level the playing field. First, they need to convert all existing non-merit initiatives to a merit-based format, with the sole aim of eliminating destitution and deprivation. Secondly, the tax regime has to be corrected to become truly progressive in nature. Under this corporations and the richest individuals pay more to the state in order to redistribute resources across society. Over the past few years, nations across the world have corrected their tax regimes to tax capital income fully. Additional income so raised must be directed towards reducing taxes on labour income to allow a widening of savings and capital base. Thirdly, IMF made a case for India to reduce its dependence on indirect taxes and increase reliance on direct taxes.Indirect taxes are considered regressive as they are levied uniformly across all individuals, irrespective of their income levels. In India, however, the share of direct taxes to gross domestic product has been falling. From a high of 5.93% in 2008-09, it has come down to 5.47% in 2015-16. Lastly, India must use the money saved from these changes to increase allocations to socially and economically beneficial sectors such as education, hygiene and health care dramatically. Evidence from more than 150 countries – rich and poor, and spanning over 30 years – shows that overall, investment in public services and social protection can tackle inequality. For just 4% of its GDP, India could provide “a basic and modest set of social security guarantees for all citizens with universal pension, basic health care, child benefits and employment schemes”, the United Nations Development Programme had said in its Human Development Report, 2015.